With over 10 years of research, Tillage Radish® is an example of a high quality product with superior genetics. Please refer to the newest Resource Guide filled with all kinds of information including planting tips, yields, research and pictures. 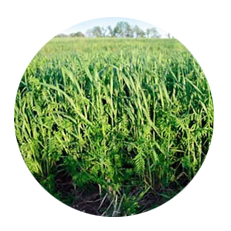 Sometimes referred to by cheap imitators, Tillage Radish® is the only cover crop radish proven to boost crop yields while delivering other measurable soil benefits while avoiding many problems traditionally associated with cover crops. 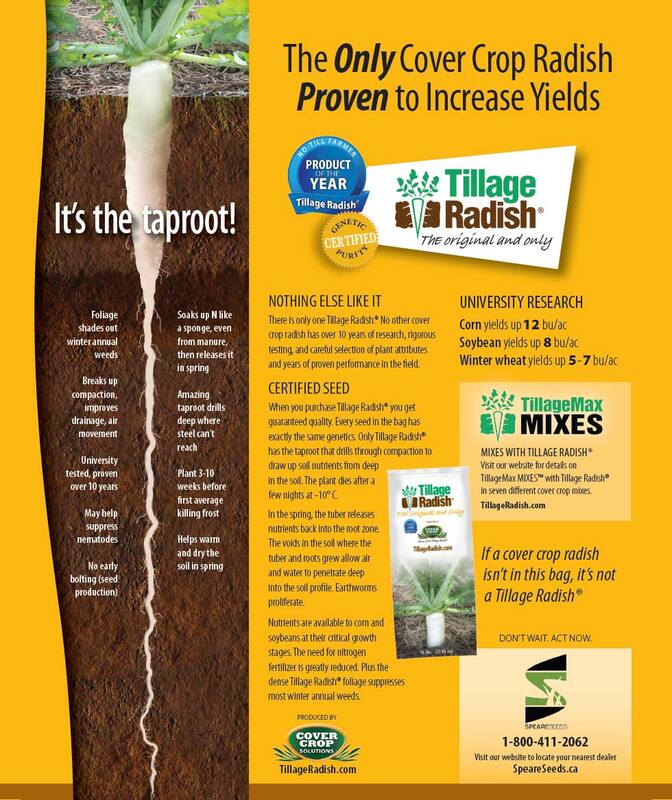 Tillage Radish® may be the single most beneficial cover crop ever developed. Over 10 years of university research and on-farm testing prove the remarkable facts. When Tillage Radish® is used as a cover crop ahead of cash crops, the following results have been recorded and reported. The cover crop radish that pays you back! Corn yields are up 11%. Soybean yields are up 10%. The superior genetics behind this amazingly aggressive brassica taproot are found only in the Tillage Radish®. No other cover crop radish has a taproot that drills through compaction like it's not even there. In fact, that's how this amazing cover crop got its name. It drills down where steel cannot reach, it tills the soil naturally and better than any tillage equipment possibly can. Please view the following Tillage Radish® brochure to read Canadian testimonials and the many success stories. If the product does not come in the Cover Crop Solutions 50 lbs. bag seen here, it is not Tillage Radish! The only problem is: There is nothing else that compares with Tillage Radish when it comes to the yield increases, the genetics, the research and the years of farm-tested reliability you get with every bag of Tillage Radish. Tillage Radish is what you want! 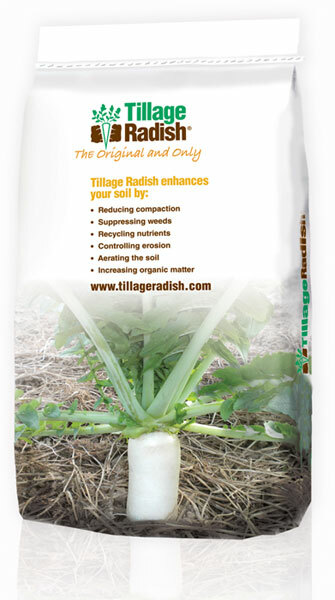 You will have success with Tillage Radish seed wherever agricultural crops are grown (pH range 5.5-7.5). For best results, plant cover crop radish seed in late summer to early fall, at least 3 weeks before the average first killing frost date. Tillage Radish seed will germinate rapidly and typically start appearing within days. If using a burndown herbicide to clean up existing weeds, wait no longer than 2 days after planting Tillage Radish seed. Tillage Radish begins to winterkill when temperatures fall to the mid-teens for 2 or 3 nights, similar to fall-planted spring oats. In most areas, Tillage Radish will decompose in time for spring planting, preparing the field for planting conditions and enhancing the availability of nutrients already in your soil. If Tillage Radish does not winterkill, apply a combination of 1 pint 2,4-D type herbicide along with 1 quart glyphosate when first flowers appear. Fertilizer input needs are significantly reduced; available leftover (N) has been held and herbicide is reduced due to Tillage Radish suppression of winter annuals. IMPORTANT: If Tillage Radish seed is planted very early as a cover crop, flowering can develop before they are winterkilled. This can be controlled with mowing or burndown with the active ingredient Glyphosate or 2,4-D equivalent at flowering. NITROGEN: In order to grow to their fullest potential they will need 40-60 lbs of (N) – accumulated or residual. Most fields have enough (N) left over from the previous crop. Upon decomposition in the spring, Tillage Radish will give (N) back in time to utilize in the spring crop. Applying manure or chicken litter is preferred before planting but can be done just prior to emergence. Liquid manure can only be spread after plant leaves are 4” in size. The practice may cause some burning of the leaves and will have plant damage along tire tracks. The Tillage Radish tuber will take up to 150 lbs/acre of (N) from the manure, so it is a great benefit to store nutrients when there is a need to spread manure after planting. When blending Tillage Radish with grains cut Tillage Radish seed rate to 4 lbs/acre and cut the grains rate by 25% of your normal seed rate, eg. If your normal grain seed rate is 1 bu/acre, cut it to ¾ bu/acre, etc. Same rule applies with planting Tillage Radish seed with Sorgam-Sudan grass. Tillage Radish seed needs a chance to get started in pastures, it is ideal to have the grass grazed low or cut low with adequate moisture prior to planting. Have the soil (N) content at least between 40-60 lbs. Seeding rate is 4 lbs/acre drilled. Broadcasting will only work if there is adequate seed to soil contact - use 6 lbs/acre. 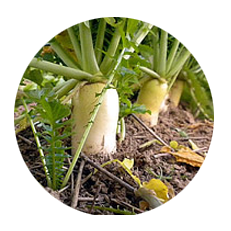 The cover crop radish is very digestible and provides many nutrients. Having other species established provides a balanced diet. Here's everything you need to know for successful planting of our cover crop seed products, including seeding rates and blending tips. Click here to review and/or print this handout on planting tips. 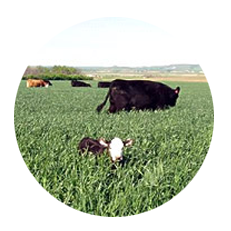 The new TillageMax Blends is a line of high performance cover crop and forage blends. 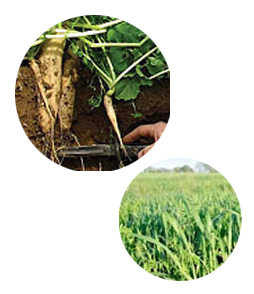 Each blend delivers the benefits of Tillage Radish® with the superior characteristics of Tillage RootMax™ Deep Root Annual Ryegrass, CCS Crimson Clover and CCS Oats. Please click here for more information on Tillage RootMax™ and TillageMax Blends.